An Amazon seller reached out to CJ requesting some information about Amazon Fulfillment Services. See yet another satisfied customer in this video! Should you have any questions regarding Amazon seller issues, reach out to us for a free consultation. 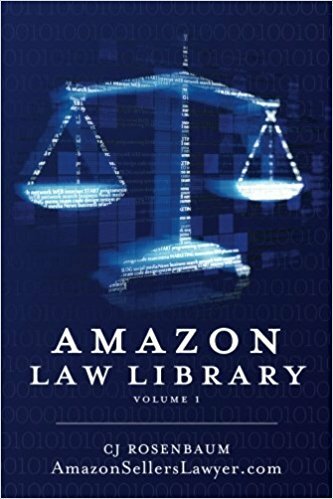 This book is intended to be a “bible” of all legal issues surrounding Amazon and the use of its online platform. Containing summaries of nearly every case Amazon has litigated within the past several years, the book is written in everyday terms to make the material accessible to anyone, whether they have a legal background or not. Anyone who wishes to become a seller on the Amazon platform must agree to Amazon’s conditions of use. The conditions for sellers are extremely strict, and Amazon takes their enforcement very seriously. The terms of this agreement are complex, but Amazon has put them in place in order to promote the maintenance of a safe marketplace for consumers, sellers, and manufacturers alike. However, Amazon often reacts harshly towards sellers who violate this agreement in order to protect themselves. The Amazon platform is unpredictable in the way it handles issues with sellers, so it is important to be prepared. When a seller has been suspended by Amazon, their reinstatement is handled on a case by case basis. By purchasing this book, you are already taking a step towards bettering your Amazon business and/or understanding the complex issues surrounding the Amazon platform. Amazon has been involved in far more legal issues than many people realize. We hope this book helps anyone involved with the Amazon platform to educate themselves, avoid problems, and maximize their success as an online entrepreneur.